+1 on the sticky suggestion. Nice compilation for people who are looking to get a top quality smoker. Maybe get some feedback from owners going, retitle it and sticky it " Pit builders and customer feedback"
Posted: Sat Apr 01 06 3:27 am Post subject: Lang??? I don't think this was mentioned about the Langs. You take out the racks and crank the heat to 400 and use the plate that runs the entire lenght of the pit as a fry grill. Ah, pancakes in the morning, hamburgers in the afternoon. Now you can't do that with most smokers. 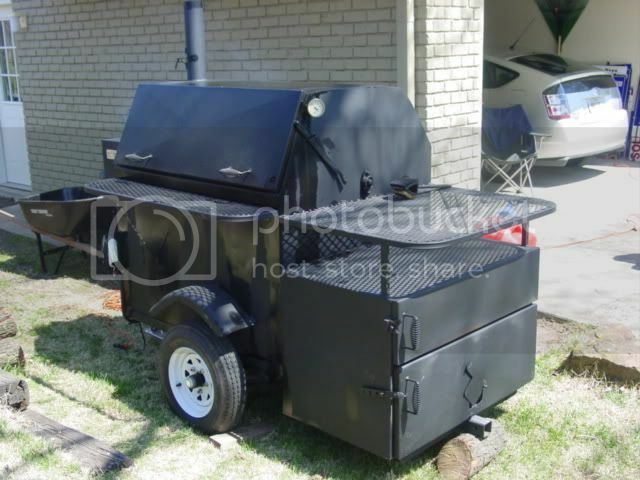 It is a smoker and a grill just like in a restuarant!!!! Thanks Zilla, and I second the recomendation of a sticky. Another option is the "build it yerself" cooker! I got exactly what I wanted, and had a direct line to the builder/fabrication department! For those not mechanically inclined, there are a lot of great options out there. Just depends on how much ya got to spend! I have just had a chance to read this post and I agree with almost everything said here. All the pits listed are awesome pits that cook great and will last a very long time. Now let me add my two cents, Diamond Plate Products builds a great pit and gives you a great bang for you buck. I am a DPP Fat50 owner and a DPP dealer, so I may be a little biased. Plus my DPP and I just did great in our first compitition. But in the end, you can not go wrong with any of the pits listed in this thread. Let me know if you would like more info on the DPPs. Founder of the seldom seen Touch Of Smoke BBQ team. Here's another one for your list. Don't know much about them. The few pics I've seen of them on the web look pretty good with a good selection of cookers available. Some are reverse flows similar to Lang's. The main reason I'm mentioning this company is because they're outside the areas where pits are easy to find. And another one I forgot about for a little while. Also a little further north than a lot of pit makers. Roger is the brother of the original owner of OK Joes pits and his line pretty much mirrors the original OK Joes. Done! Thanks AllSmoke. They remind me of the Tucker Cookers. I like that style for a mobile pit. Do you own one? Yeah...I've got the Commercail Rotisserie. I would like to add this pitmaker. He's located near Austin, TX, in a small town called Buda. 1MoreFord when I was in the market for a new pit I went and checked those guys out since they are not to far from me. The make great pits; great welds and top noch construction. Great pit for the money. They do not build custom pits they have modles and can get a few add ons. They are know for their charcoal hog rosters. The people there are very friendly and helpful. The guy there took time out to spend a good amout of time with and very helpful with all of the question I had. I also think the one guy there plays a major role in setting up some of the bbq comps in PA. If you go to the new holland summer fest you will seee many people using them. I came very close to buying one. What turned me away was the steel was not too thick. Not like Gator, Bates, Dimond Plate.... Also for the size pit I wanted I would have to go with one of hog roaster which I would have to burn charcoal and Im a stick burner. They did have the traditional offset like I wanted. Now they do and they look very well made. They make great pits for the money. they are a great pit if you are out of bbq country and and you want a great pit but you do not want to pay that much to one shipped up. Thanks fellas, I added those pits and about 6 more I found this week. I think this is the most complete list on the web right now. I have not come across one more complete. Thanks for your help. It would be great to get a builder listed in every state if there is one. Thanks Chris, I knew about them but I couldn't remember the names. I added them to the cabinet smoker section. Carsins, what did you end up doing? Rocky, Hasty Bake, and WSM's should probably be added. Ceramic cookers like BGE, Primo,and Kamado should be included as well. All of these smokers can turn out world class food. Jeff, Thanks for the input! I added Rocky the other day but I'm not going to add mass produced pits like the others. Your correct they are great and produce great Q but they are eaisly found on the net with a google search. These guys took a bit more hunting to locate. I just started a list of commercially made pits also. I'll add these to that list. Thanks again! I agree with you about the WSM. Got another one for ya, Sikes Cookers out of Vidalia, GA. They have a serious following there in onion country, I lived down that way for 3 years, had the pleasure of using one of their cookers on a few occasions. Different kind of cooker, works VERY well. Gotta look out for my GA boys! !